This article explains the different mechanisms for connecting the Antenna Tracker to a GCS (or even multiple GCSs at the same time). 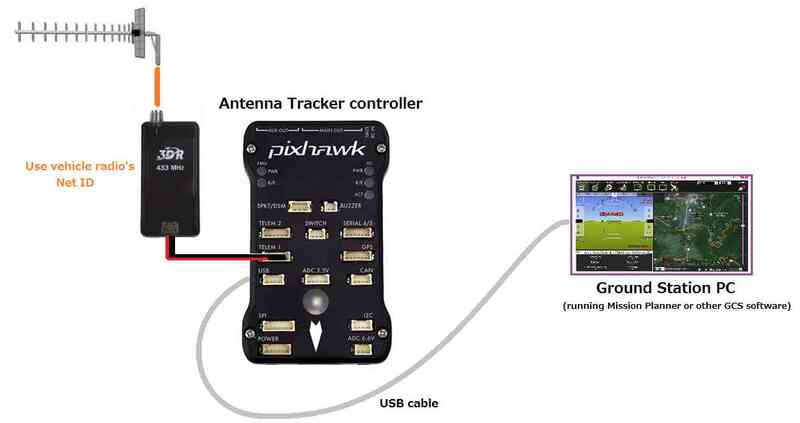 If the antenna controller is a Pixhawk you can simply connect your ground station computer to the Pixhawk using a long micro USB cable (like these from ebay). On an APM2 the micro USB port and Telemetry port cannot be used at the same time which means that to connect with a USB cable, the radio must be moved to use UART2 (aka Serial2). The UART2’s TX, RX 5V and GND pins are on the right side of the APM2 as shown on this wiki page. A second pair of radios (or even a bluetooth data link) can be used to connect the Antenna Tracker controller to the PC running the ground station. If using a SIK radio the Net IDs of the radios connecting the Antenna Tracker to the PC should be different to the Net IDs for the radio connecting the vehicle to the Antenna Tracker.